This is a quick fix for a sneezy and drippy nose. To treat nasal allergy all the ingredients can be found in the kitchen. Allergies are tough to be carried as an adult or even as a child who has stuffy nose, itchy and red eyes. The ability to fight nasal allergies is linked to the strength of the immune system so, you can try a couple of home remedies can help ease your suffering. Raspberries and blueberries contain high amount of vitamin C and flavonoids that may mitigate the response of the histamine for allergies in children. Try serving ¾ cup once or twice daily. You can also mash ripe berries. The shiny and beautiful fruit has huge amount of vitamin C which acts as the stabilizing agent of the mast cell. Mast cells act as the mediators as they help release histamine. The chunks of these raw fruits act as a choking hazard for younger kids. You can feel and grate apples before serving. You can also have them baked. The anti-oxidant quercetin is found in this vegetable. When you breathe in diffused peppermint oil it can help treat the nasal blockage. You can also diffuse lemon, lavender and peppermint oil and relieve your nasal passage from clogging. The simplest way to use it would be by putting a few drops on your palm and simply breathe it in. Take a teaspoon of organic apple cider vinegar and mix it in a glass of water. Now, drink this mixture daily three times every day. Cinnamon is a great remedy for various respiratory problems and especially for nasal allergy. Mix ground cinnamon with a spoonful of honey and then take the tablespoon of the mixture atleast 3 times. It is the natural cure all medicine that has various antihistamine properties. Histamine is an ingredient that is the irritation causing chemical which is secreted when someone is suffering from allergy. You need to take a pinch of black seeds and chew them all slowly and after that drink a glass of water. In a cup of boiling hot water and add 1 piece of ginger to it and leave it for a few minutes. It will provide instant relief and will also heal the inflammation when you take it a few times. You can eat fresh horseradish to open the nasal passages. The spicy flavor, pungent smell can help relieve the nasal passages. Peppercorns, onions, ginger, fennel and even hot mustard can helpopen the nasal passages. You can also add some extra chili to the food when you feel stuffy nose. You can take a tablespoon of raw honey daily which will enable your body to build tolerance to treat local pollen. 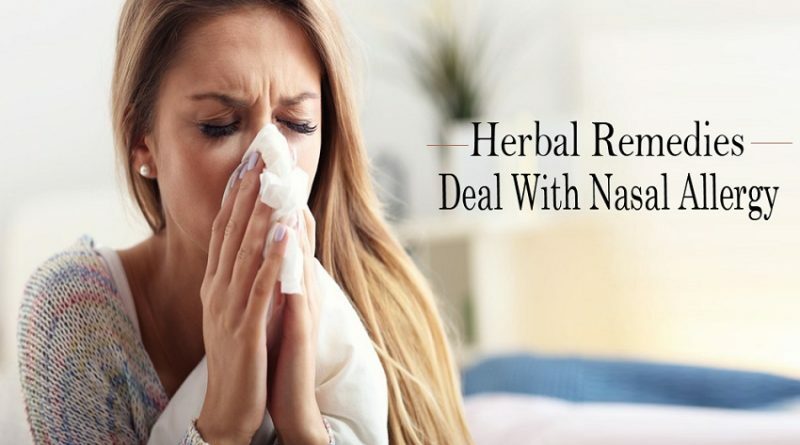 Ayurvedic Treatment of Nasal Allergy is the best approach to treat any kind of allergy as it does not give any side effect and it soothes and relaxes the body.